In Second Life, the British designer Graham Dartmouth is a well-known and experienced expert in the matter of 3D modelling and texturising. 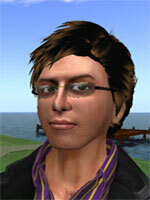 Since a long time, he is taking active part in developing and invention of Meshes in SL. Graham shared his knowledge about this vast field of topics in classes at the respected inworld school Builders Brewery. There I also had the opportunity to participate on his introduction lecture "Meshes and You". I consider Graham's presentation for so infomative and easy to understand that I asked Graham for permission to translate it into German. Thanks to Graham's generous permission, I'm able to provide the original English essay here as well. So what are meshes and how do they vary from sculpties? Actually, the entire grid is made up from meshes, you can see this if you switch your viewer to wireframe mode (PC: Ctrl + Shift + R, Mac: CMD + Shift + R). Weird looking huh? By the way, it's the same keystrokes to return to normal view. Everything on the grid (apart from avatars) is made from the basic SL building block, the humble cube. We can stretch it, shrink it, torture it to different shapes (cylinder, torus etc), path cut it, shear it, hollow it and all those other goodies on your build menu. Then you add textures to make the amazing builds we see around us every day. All derived from a simple mesh cube. Back in 2007, Qarl Linden introduced a new form to the grid, called sculpties which we all now know and most of us love, but back then, it was greeted with much fury and protests about how it will kill off the prim, and all our hard work and time we have invested in making our prim builds will have been wasted. Sculpties did not kill prims, they simply gave us another building tool to work with. Today, we are hearing much of the same fury and protests about meshes, and I will tell you that meshes are a completely different animal to sculpties, and they will not kill them off. Many of you have been told that sculpties are meshes, and to a point, this is true. Many of us make sculpties in off world mesh modelling programs like Blender, Maya or 3DStudio Max for example. But they all need special plug-ins or scripts to convert them to sculpties. And that is because sculpties are Sculpted Prims, not meshes in the same sense as what is going to be introduced. A sculpt uses a sculpt map to tell your viewer where to render the surface of that prim so we can now have weird and wonderfully shaped objects too. But it is still the same basic building block: the humble cube. We have all experienced that building block when we suddenly stumble into something that isn’t there, but its a close by sculpt which we have to turn to phantom, like in some stairs. Another thing to remember is sculpts have a very strict set of rules to adhere to as in the number of faces, the shape of the base mesh used to model them and so on. Meshes will remove some of these restrictions for modellers. So, if meshes remove these restrictions, why won't they kill sculpties? Meshes are uploaded to the grid in a completely different way, and the server code and viewer code has had to be re-written to enable us to see them. This is some of the fury about Linden Labs 'forcing' us to Viewer 2. They are not forcing us, but the Viewer 1.x code simply cannot handle mesh rendering, so if you want to see meshes, you will have to use a V2 based viewer. Personally I dislike V2, but accept that I am going to have to accept the change, if I want to continue to experience SL to its fullest. But the truth of the matter is that in time, v1 viewers will be antiquated and the code will become less functional. Since the introduction of mesh, Many V1 development teams have managed to back port mesh code into their respective software, so there are now a variety of V1 viewers that can see mesh. A full list of these can be found at http://www.buildersbrewery.com/tpv/. Just a tech side note here for those interested.. the delay in others catching up is because part of the graphics software used by LL for the render process is proprietary (hence not open-source for other developers) and LL are not allowed to pass this on to the TPV's under the licensing terms. How "weighty" are meshes for us in SL? These changes in how things render will affect a sim's capacity for prims. Currently on a full sim, we can have 15000 prims, that wont change. But meshes have a render cost. What does render cost mean? Simulation Weight: how much resources the mesh takes from the server capacity). A combination of all of these will determine the Land Impact (LI) cost (Note: The earlier used term "Prim Equivalent" has been disestablished by LL). So this means 1 mesh DOES NOT equal 1 prim. It will depend on the complexity of the mesh, and also other factors like the physics mesh associated with it and the scripting inside the object, and even the scale of the mesh (physical size). However, sculpties will be regarded as a "legacy" prim, meaning that 1 sculpted prim will still have a prim cost of 1. LL has released the formula, but to be quite honest, it makes my head hurt to look at it. As a designer, you will be informed just before uploading much both the land impact, and the L$ cost will be. This is one major reason why Meshes will not kill off sculpties and prims. 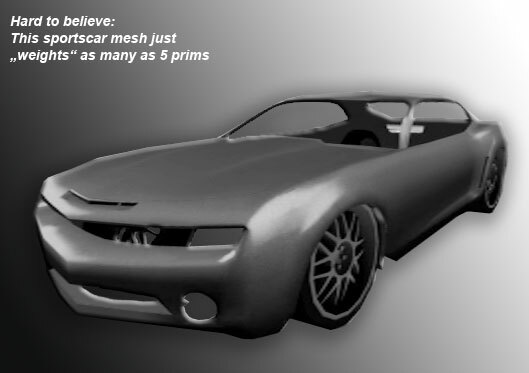 Even when objects are composed of many prims and/or sculpties, it must't mean automatically that the same object built of one or just a few meshes may cause less prim equivalent costs. The key for understanding are polygons. The more complex the shape of the mesh, the worse it gets. Curves are complex to render, since smooth curves need many single vertices. So it is evident that meshes don't provide advantages for all applications. After things settle down, and we learn where the niche for meshes is, they will become a valuable addition to our army of building tools. For those considering modelling with meshes, I cannot urge you enough to learn good modelling practices, and economical use of polygons, otherwise you will end up with very heavy meshes that will a) lag the server severely, and b) be unmarketable in SL! How much will meshes cost to upload? This is a variable cost based on the Land Impact of the mesh. Currently prices start at 11L$, the most I have paid is 113L$. The more optimised your mesh is for SL, the cheaper it will be. Although 113L$ sounds a lot, that model represented 160 prims in Land Impact. If you consider a sculpt map costs 10L$ to upload (a sculpt will always be 1 prim under the legacy rules), the equivalent cost in sculpts would have been 1600L$! Will we be able to create meshes inworld? A number of tools for creating mesh inworld are being developed, with varying degrees of complexity. But it should be remembered that most of these tools will also require some knowledge of an offworld modeling program to optimise them for game use. The definition and detail is much higher, which will lead to better looking content. Sculpts are shaped from a predetermined mesh, shape geometry etc., whilst meshes cn be made from the ground up without any restrictions. In some applications, they will actually reduce prim count, if modelled correctly. Better physics control: No more phantom sculpts with invisibe prims inside. Providing that the build has been carried out carefully, a designer using meshes has it much more in hand than with sculpties to achieve excellent LOD values. Avatar rigging makes it possible that your clothes actually bend with you. No sculpt collars sinfing into your chest as you move. Instead of just applying one single texture of the entire object, meshes can be decorated with up to 8 different texture materials. For uploading meshes, the clumsy way of generating a RGB colour sculptmap is no longer required, so that the data can directly imported to SL via Collada 1.4 format (file extension *.dae). Mesh is something new to us in SL, and I feel that their growth will be similar to that of sculpties. When LL released sculpts, they pretty much said "there is the specification guys, go create" and all the tools we now use for sculpting were develope Sculpt Crafter, Prim Oven, Sculpt Studio, also the tools that allow us to use offworld progs, the scripts for Blender, 3DSMax, Maya etc. were developed by SL residents. So it will take a little time for new mesh tools to arrive for inworld use. On the other hand, several offworld programs are suitable for mesh creation without any need for a plugin. My personal choice would be always Blender, but also Google Sketchup is a good tool for beginners. In general, all 3D tool can be chosen which is able to export Collada files. LL has had them in open beta testing for over a year now, trying to anticipate and avoid foreseeable problems, but we have to remember that the SL game engine is over 10 years old, and they are trying to shoehorn the new technology into it. There are bound to be problems. A side effect of mesh is we can make megas up to 64 m gridwide, since all regions are now mesh compatible. Auryn Beorn, our beloved resident scripting teacher in the Builder's Brewery, has given us a script to allow non mega supporting viewers to create megas. I do feel that meshes will be a useful tool for content creation, once we all learn correct and efficient use of them. Recently a student put it very well. She said we have to learn when to mesh and when NOT to mesh! Furthermore I got the impression that they'll probly fix more bugs in the few months after release than in that whole year of beta though - the public seems to be far less tentative with pushing boundaries, and that really is the key to meshes. © Graham Dartmouth 2012. Last update: May 19, 2012. Revised for publishing by Almut Brunswick by courtesy of the author. primbusters.com is Graham Dartmouth's own webpage about 3D modelling and texturising. Second Life Wiki: Mesh/Creating a Mesh provides comprehensive first-hand information about the mesh topic.